We are extremely pleased with the quality and the accuracy of the website image to what we received, so much so we are adding 3 more sets to the 2 we first purchased to be placed in our own home! No matter where you set your table with Palm dinnerware, you'll be immediately transported to a tropical island, complete with swaying palm trees nestled beside clear azure water. A sand-colored ground with a beaded edge is the backdrop of the embossed palm design. Love these dishes. The colors on the palm tree Patten are soft and beautiful. Perfect for everyday use. These dishes are the most beautiful thing I have ever seen. I knew I was going to like the tropical design but I didn’t expect to love them so much. In person, they are so much better. I’m so happy they are microwave and dishwasher safe. I will definitely buy a second set and think they will last forever. Great quality. Love it. We live in a resort area where everything is beachy and tropical. 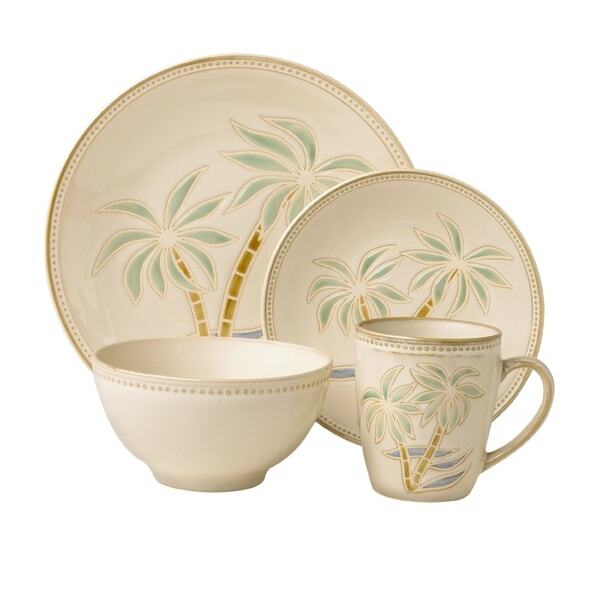 This set matches our décor and love the fact that it is microwaveable and dishwasher safe. The color does not fade in the dishwasher. We love our set. I would recommend this for anyone who is looking for a coastal set. Great product. I absolutely love this set of dishes! It goes perfect with my coastal theme. Very well made amd heavy duty. You can't go wrong with Pfaltzgraff products. I plan to actually order another set . Thank you. "Did anybody get these dishes in brown?"